It is rare that someone gives you this much of an "inside" look at the details of their business and their plans for the future. I'm telling you tell this is a major shift for this industry. I know that for a fact because for years, I was part of this industry and even now, I have plans to build more storage facilities locally and across the State. And yes, I was planning to "update" those facilities to the most modern standards with automation carrying as much of the load as possible, but nothing like this (although we did take a look at a similar setup back in the nineties - there just wasn't enough infrastructure to support the project). What most people miss is that these companies are valued primarily as real estate plays that just happen to have a recurring revenue stream with mildly "sticky" customers - meaning the customer base actually turns over very little. Despite what you may think, people have a tendency to keep their "valuables" in storage for a very long time. And even when the prices goes up, they continue to pay and pay and pay. 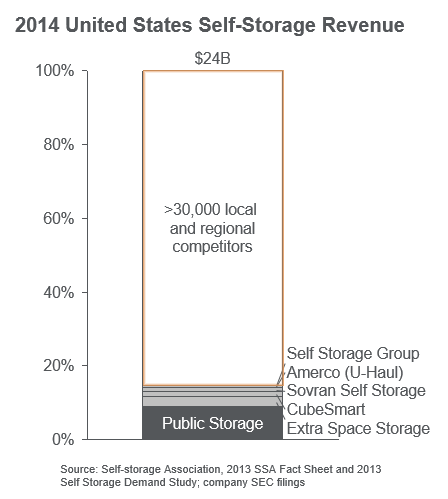 Public Storage does about $2.4 billion in revenue and has a public enterprise value of $44 billion. Why is it so valuable? Basically it’s traded as a Real Estate Investment Trust (REIT) and its investors likely see a large property portfolio with a steady stream of cashflows from full facilities and the ability of storage companies to increase prices every year on captive customers who in our research mostly won’t drive more than a few miles to take their goods to storage. And where they see stability we saw a sitting duck. What's interesting is that most of the "other" large players in this field will not be able to counter this shift in strategy. They just can't. They're too invested in their own game to change now. Let me give you an example you may have heard about: Southwest Airlines. Their business model has been crystal clear from the beginning: One type of aircraft, quick turnarounds, direct flights whenever possible, intense focus on execution, and absolutely no frills. When they first began, they even made a joke of providing only peanuts - remember? Everybody laughed. Including the larger, more established airlines. Despite SWA putting its strategy and operational plans out there for anyone to copy, no one did. OK, so there was a new upstart or two that copied SWA's playbook and began operating a sort of SWA "light", but for the most part SWA was ignored. Because the incumbents could not adapt to the changes in the marketplace and SWA could and did. Don't misunderstand. The existing "dinosaurs" saw the meteor coming. They just couldn't get out of the way. These are smart people. They had to realize they were watching the death of their prized business models. But adapting to those changes was simply unthinkable. There were too many rules, regulations, and in-house structural operations already in place. I've added the link to the entire article here (Becoming the Amazon of Public Storage)and there are some really good points about operations being the real key to their success. More importantly, you should take the time to read through the article (don't worry - there's plenty of eye-candy) and actively think about the industries you know and how they would react to these same circumstances. Because changes like these are coming. And not this year or the next. They are coming right now. Across the nation, to your town, and down the street from where you're sitting reading this. As a courtesy, and as a fellow dinosaur, I'm giving you a "head's up" and letting you know that I've seen the meteor and it's coming for us. You can hang around and wait for the impact, you can try to run, ... or you can learn to adapt. Source: VALUE PROPOSITION What is it?